This month's meeting was hosted by Betty. In attendance along with Betty were Carla, Colette, Jane, Janet, Jolene, Michèle and Shirley. Betty served some excellent cheese and vegetable rolls and chocolate along with a wonderful apple crisp. 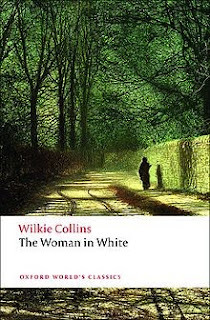 This month's book, Colette's choice, The Woman in White by Wilkie Collins is a book originally published as a serial in the "All the Year Round" periodical in 1859-1960. It is considered to be one of the first mystery novels and a pioneer in the publication of sensation novels - tales of women woven around criminal activities. Mr. Collins was a friend of Charles Dickens who was the owner of the periodical. The book was published in three-volume form in 1860 and along with its publication in book form came The Women in White perfume, cloaks and bonnets and sheet music of The Woman in White waltzes and quadrilles. In the 1982 a U.S. movie version of the book came out and in 1997 a British version of the movie was made. Andrew Lloyd Webber also created a musical in 2005. The book presented some challenges for several members of our Muses & Views Book Club. The length of the book 645 pages, was difficult for about half of the members present to finish. However, some watched the movie that gave them a good idea of the plot and the characters. Michèle said that the 100 pages she did read gave her the desire to finish the book. Carla, decided to try listening to c.d. 's of the book on a trip to Toronto but the book, read by a person with a decidedly British accent and the description of Marian Halcombe's waist when Mr. Hartright first saw her in the drawing room, ".....her waist, perfection in the eyes of a man, for it occupied its natural place,...." was too much for both Carla and her husband. However, Carla did read the novel, borrowed from her brother, and enjoyed it, once she got past, Mr. Hartright's description of Miss Halcombe's waist. All those who read it enjoyed the the narrative first person characteristic of the novel. Each person in the novel tells his or her side of the events and the story in their own words. This method of writing helped develop the characters in the novel. All who read it found the story engrossing and had a difficult time putting it down. The novel was a good suspense, and the ending was particularly gripping. We had some discussion about the frustrations of the Victorian era, class, pre-arranged marriages and the plight of women, how little they could do alone and how much single women were dependent on relatives for their livelihood. Colette wondered if this was a good choice for the book club, all said that there was a place for the classic novel and a look back at the writing genre of the past. We all thanked Colette for her choice. Jane provided us with two articles written by John Sutherland, The missing fortnight and Why doesn't Laura tell her own story?